Cars began appearing in Ray City and Berrien County, Georgia for the first time in the early 1900’s. Dr. H. W. Clements was one of the earliest car owners in Berrien County. With increasing automobile traffic, Ray City residents were soon turning to businesses that catered to this new locomotion. On June 5, 1917 when registering for the draft for WWI (WWI: Ray City Goes to War) Gordon Vancie Hardie was living and working in Ray City, GA. At that time he listed his occupation as a self-employed “Automobile Repairer”. In 1920 he and his wife, Addie B. Hardy were living in a house on Jones Street in Ray City, Georgia. By that time Gordon had expanded his trades. He was the proprietor of a “beef market” which he operated on his own account. The Gordon meat market was one of two butcher shops among the historic businesses of Ray City appearing in the Census of 1920. By 1925 Gordon V. Hardie had returned to the automotive service industry. He built the first gasoline station in Ray City, GA, a brick building which stood on the south side of Main Street just east of the tracks of the Georgia & Florida railroad and southeast of the corner of Main and Paralleled Streets.These automotive entrepreneurs were just a few of the Ray City businesses operating in the town’s boom period of the 1920’s. By 1930 the Hardie Filling Station had competition in the service station business. Moses L. Giddens was a garage and station owner, and Carl F. Murry was employed at a filling station. Charlie J. Shaw was a self-employed automobile mechanic. In the 1930s, the South Georgia Oil Company, a gas and diesel dealership based out of Tifton, GA, had a location at Ray City. 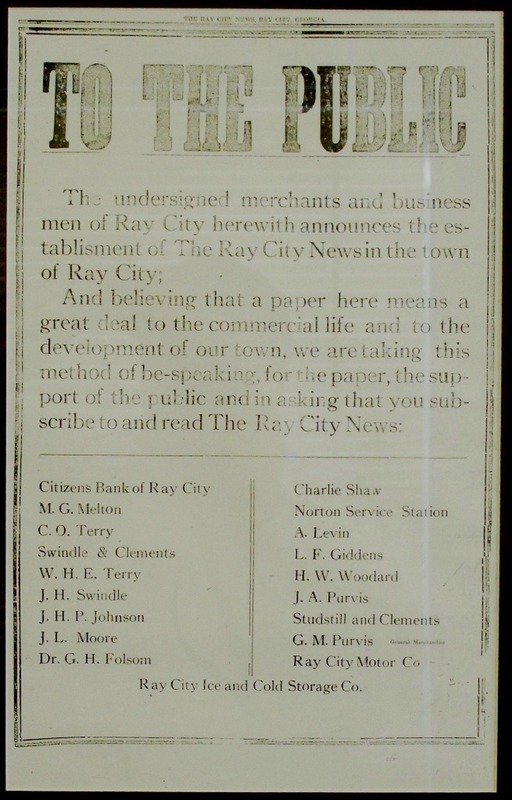 Among other automotive business firms operated in Ray City in the 1930s were Ray City Service Station, Norton Service Station, Ray City Motor Company, Colonial Oil Company, Highway Service Station, Standard Oil Station, Shaw’s Garage, and Swain Garage. Wilbur Aultman owned a filling station and lunch stand that was destroyed by fire in 1937. The census of 1940 shows Levi J. Futch, Arthur A. Carlson, Willie Wright Ware, and J. B. McSwain all were working as automobile mechanics. Herman B. Guthrie was a gasoline station operator, and George Emory Swindle, a son of L.C. Swindle, was an automobile salesman. In 1945, J. B. “Mac” McSwain went into partnership with D.L. Fletcher to open Fletch and Mac’s Garage in Ray City, GA. Among the products featured at the new service station were Woco Pep gasoline and Tiolene Motor Oil. 1949 Georgia Map, Standard Oil Company, featured “Okefenokee Swamp Park, near Waycross, Georgia” on the cover.